Kali-yuga, the Age of Quarrel, is a period of time lasting 432,000 years and characterized by hypocrisy, degradation, and an overall rise in vice. It is the last and worst of the four great ages (Satya-, Treta-, Dwapara-, and Kali-yugas) mentioned in ancient Vedic literature. We're now living in a Kali-yuga that began around five thousand years ago. The sole redeeming feature of Kali-yuga is that anyone can be released from degradation and anxiety simply by chanting God's names. Chaitanya Mahaprabhu, who is Krishna Himself in disguise during Kali-yuga, encouraged everyone to chant the Hare Krishna mantra. Many scriptures recommend this chant as the most direct route to genuine happiness and enlightenment in the Age of Kali. 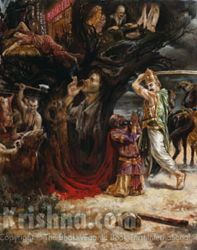 The painting depicts the vices of Kali-yuga and the arrest of Kali personified. (see Srimad-Bhagavatam, 1.17). Spiritual Strategies for the Age of Iron - making the best of the worst of ages. The Strategy of Atheism - how Kali-yuga's rise of atheism coincides with Krishna's appearance as Lord Buddha. Cross-cultural Traces of Vedic Civilization - widespread historical evidence supporting the Vedic view of time. What's So Special About God's Names? - the significance of mantra meditation in Kali-yuga. "The duration of the material universe is limited. It is manifested in cycles of kalpas. A kalpa is a day of Brahma (the first created being, engineer of the universe), and one day of Brahma consists of a thousand cycles of four yugas, or ages: Satya, Treta, Dvapara and Kali. The cycle of Satya is characterized by virtue, wisdom and religion, there being practically no ignorance and vice, and the yuga lasts 1,728,000 years. In the Treta-yuga vice is introduced, and this yuga lasts 1,296,000 years. In the Dvapara-yuga there is an even greater decline in virtue and religion, vice increasing, and this yuga lasts 864,000 years. And finally in Kali-yuga (the yuga we have now been experiencing over the past 5,000 years) there is an abundance of strife, ignorance, irreligion and vice, true virtue being practically nonexistent, and this yuga lasts 432,000 years. In Kali-yuga vice increases to such a point that at the termination of the yuga the Supreme Lord Himself appears as the Kalki avatara, vanquishes the demons, saves His devotees, and commences another Satya-yuga. Then the process is set rolling again." "O learned one, in this iron age of Kali men almost always have but short lives. They are quarrelsome, lazy, misguided, unlucky and, above all, always disturbed." "Whatever result was obtained in Satya-yuga by meditating on Vishnu, in Treta-yuga by performing sacrifices, and in Dvapara-yuga by serving the Lord's lotus feet can be obtained in Kali-yuga simply by chanting the Hare Krishna maha-mantra." "Those who are actually advanced in knowledge are able to appreciate the essential value of this age of Kali. Such enlightened persons worship Kali-yuga because in this fallen age all perfection of life can easily be achieved by the performance of sankirtana."